With the ever-expanding and innovative uses of biotechnology in medicine, agriculture, and other equally essential fields, there comes an intriguing question: where can biotechnology not be applied? As with all scientific pursuits, arguably the sky’s the limit. That seems to be the ethos of two entrepreneurial forces which are each working to bring biotech into a completely new domain: beauty. For biotech-turned-beauty company Amyris, this means introducing Biossance, a plant-based skincare product with engineered ingredients that mimic molecules naturally produced by the human body. Then there’s AOBiome, parent company to Mother Dirt, that is working to incorporate beneficial bacteria into facial sprays with the thought that our skin biomes actually need such microbes to thrive. What initially began as a Berkeley lab project to manufacture a readily available cure for malaria has led to a skincare revolution founded on the principles of sustainability and health-conscious living. Biossance is redefining beauty, bringing the industry closer to newer environmental standards. And the best part of the company? It is utilizing biotechnology to accomplish this. When it comes to skincare products, Biossance believes that the best source of inspiration is something we’re all inherently familiar with—the human body. Therefore, the basis of its unique products is squalane (C30H62), a completely saturated form of the lipid squalene that is naturally produced by the body’s sebaceous glands. The production of squalene in the human body decreases beginning around age 20, leading to less moisture retention in the skin. 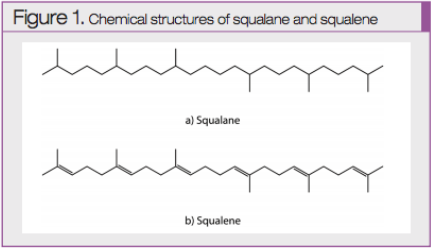 Biossance’s goal is to supplement this decrease in squalene with its manufactured molecule squalane (Figure 1-1). The difficulty with squalane is deriving it from an eco-friendly source. Its precursor, squalene, can be isolated from shark liver oil, but this animal source poses two major problems: one, it is highly unethical to target such marine life in order to extract the desired compound; and two, it is entirely unsustainable. That’s where bioengineering comes in. Parent company Amyris employs a manufacturing process that generates squalane from sugarcane-fed yeast, ensuring that the product is not only completely pure but also continually renewable. This production method is commercially feasible for manufacturing squalane on a much larger scale and is a step up from experiments of the 1990s and before. It hinges on the isoprenoid pathway and on the use of β-Farnesene, the molecule that precedes the synthesis of squalene. Amyris has engineered a microbe, a yeast called Saccharomyces cerevisiae, which is essentially a microcosm for factory production of β-Farnesene. 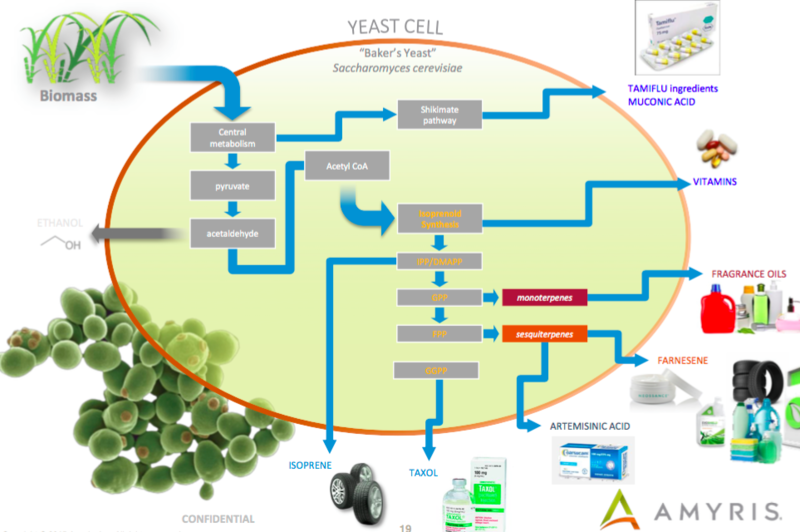 The metabolic pathway for the yeast has been altered to produce, in response to fermentation with raw sugarcane as feedstock, a mixture of squalene and other natural by-products; the yeast itself is removed after fermentation. The form of squalene produced through this pathway is highly unstable, which would make isolation a difficult task. However, a natural chemical coupling, using the pure hydrocarbon β-farnesene as feedstock, occurs after removal of the yeast, which makes isolation unnecessary (Figure 1-2). Squalane is subsequently produced through catalytic hydrogenation of squalene. Squalene’s unsaturated double bonds are broken upon introduction of a catalyst, which is later recovered, thus leaving behind completely saturated single bonds in the hydrocarbon which is now known as squalane. Fractional distillation allows for further purification by separating substances according to their differing boiling points (Figure 1-3). This process offers several advantages in the production of commercial squalane, being that it makes such wholesale manufacturing possible in the first place. Firstly, development can be easily regulated, which ensures a higher degree of quality control and homogeneity in the resulting compound. Secondly, each batch of product can be reproduced thanks to the abundance of feedstock needed for creation. And perhaps most importantly, this biological-based method upholds the environmental consciousness that Biossance espouses. Each of the products manufactured is a combination of squalane and other natural oil/gel products such as vitamin C rose oil, ensuring that only the safest ingredients are included. The products are bottled and then packaged in sugarcane fiber boxes, achieving both an eco-friendly interior and exterior (Figure 1-4). While Biossance maintains its own website, it has also partnered with Sephora to expand its sales and outreach. 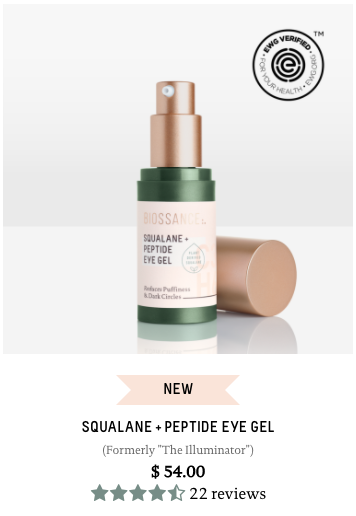 The brand became available at the cosmetics retailer in February 2017, with the Squalane + Peptide Eye Gel product quickly becoming the best-selling eye product. With the large focus on antibacterial cleanliness in today’s market, it’s a bit of a shock to find a company that is advocating for the introduction of bacteria into skincare regimens. But that’s exactly what Mother Dirt and parent company AOBiome are doing. AOBiome believes that certain ammonia-oxidizing bacteria are essential to preserving the health of human skin biomes, and their products have the goal of introducing and maintaining such healthy bacteria. 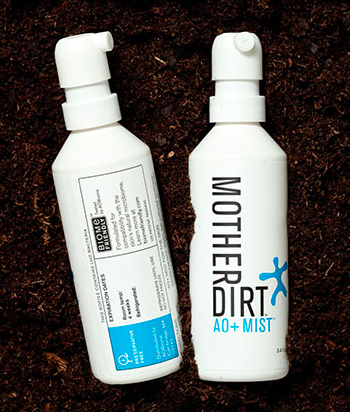 Mother Dirt is starting a trend, and it revolves around probiotics—this time for the skin. The skin biome is an amazingly diverse habitat, home to a large population of microorganisms which survive through symbiosis. Our skin provides these microorganisms with the energy they need to thrive; and simultaneously they protect our skin from harmful pathogens in the external environment. There are several factors that influence the type of flora found on the skin: lifestyle, the external environment, contact with nature, etc., all contribute to the diversity of our bacterial cohabitants, or our lack thereof. In today’s modern times, urban lifestyles and the focus on cleanliness to the point of sterility have combined to eliminate a portion of the positive bacteria in the skin biome. AOBiome speculates that our lack of helpful bacteria could potentially cause or allow for noticeable skin sensitivity, acne, eczema, and other skin conditions. It hypothesizes that reintroducing certain beneficial bacteria through specially designed skincare products will begin to solve some of these healthcare concerns (Figure 1-5). AOBiome’s Mother Dirt products focus on Nitrosomonas, which are a type of ammonia-oxidizing bacteria (henceforth referred to as AOB). AOB have a large role in sustaining the nitrogen cycle and therefore can be found anywhere that ammonia is present. The only exception is human skin; ammonia is present on skin, and yet there are no corresponding AOB. This type of bacteria is highly sensitive to soaps and therefore may have been completely eliminated by modern cleaning agents. 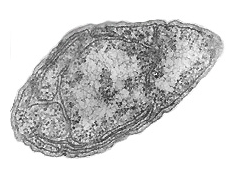 A lack of AOB is problematic due to the helpful functions that these bacteria perform. Nitrosomonas can be part of bioremediation by eliminating pollutants from the environment, a process which is appealing to the health-boosting intentions of Mother Dirt. Nitrosomonas, in general, oxidize the ammonia and urea found in bodily sweat, producing nitrite and nitric oxide critical to antibacterial and anti-inflammatory care, respectively (Figure 1-6). Nitric oxide is an entirely desirable product because of the many functions it has in conjunction with the human body. Due to its small size, Nitric oxide can permeate cell membranes and aqueous solutions, acting as a signaling molecule and performing chemical modifications on certain proteins. It affects the body in several regions: the brain and its ion channels, smooth muscle cells in blood vessel walls, and in targeting inflammation. If Nitrosomonas can establish themselves on the skin biome, it is thought that inflammation will be held at bay. Therefore, AOBiome’s product development has the goal of sustaining these healthy bacteria colonies. The point of integrating AOBiome’s research and biotechnology base into Mother Dirt products is to establish a “biome-friendly” product formula that correlates to these research findings. The survivability and success of ammonia-oxidizing bacteria in the presence of the Mother Dirt products is used as a test marker to ensure that other equally sensitive microorganisms will be able to thrive as well. The company has developed a patent-pending assay to determine that both the raw ingredients put into its products and the final formula are safe for AOBs. This intent to sustain bacteria also means that no preservatives are used in the product formula due to the detrimental effect they have on beneficial bacteria. Much like Biossance products, Mother Dirt’s merchandise is manufactured to uphold certain standards of skin safety. The products are hypoallergenic, non-irritating, and sensitive-skin friendly, as they lack any fragrance, sulfates, parabens, phthalates, or preservatives. In accordance with its research foundation, AOBiome has conducted clinical tests to gauge the overall effectiveness of the Mother Dirt formula. The data drawn from the individual conducted studies, each set up on a timeline of four weeks, illustrated improvement in three separate categories: “skin clarity,” “look and feel of rough and bumpy skin,” and “reduction in shine.” Improvement in skin clarity occurred in 35% of the 28 “problem” skin type study participants. Improvement in the look/feel of rough and bumpy skin occurred in 35% of the 24 “dry” skin type study participants. Lastly, there was a 22% “reduction in shine” for those with an “oily” skin type. As was mentioned, AOBiome is parent company to Mother Dirt. Therefore, research preceded, or better yet facilitated, the formation of the product. While the skincare products are cosmetic in nature, AOBiome conducts clinical research in treating inflammatory conditions such as acne vulgaris. Such in-depth research enables product development to have a better idea of the function of bacteria on the skin biome and therefore can potentially lead to more effective treatment results, even at the cosmetic level. What Do Biossance and Mother Dirt Have to Do with the Average Consumer? Companies like Biossance and Mother Dirt are pioneering the introduction of biotechnology into the mainstream cosmetics market. The two companies sell products similar in function (moisturizers, facial sprays, the like) but with very different niches. Biossance operates under the pretense that what the body produces is inherently best while Mother Dirt believes in the benefits of external microorganisms on the health of our skin biomes. Despite these marked differences, both cosmetics designers are highlighting nature as a key source of inspiration. Biomimicry has officially entered the beauty world. "Acne Good Bacteria Research Study." Science 37. N.p., n.d. Web. Grice, Elizabeth A., and Julia A. Segre. "The Skin Microbiome." Nature Reviews. Microbiology. U.S. National Library of Medicine, Apr. 2011. Web. "Home - Nitrosomonas Europaea." DOE Joint Genome Institute - JGI Genome Portal. N.p., n.d. Web. Kinonen, Sarah. "This Natural Skin Company Made It Into Sephora By Harnessing a Single Miracle Ingredient." Allure. Allure Magazine, 24 May 2017. Web. Libretexts. "Catalytic Hydrogenation of Alkenes." Chemistry LibreTexts. Libretexts, 28 Nov. 2016. Web. McPhee, Derek, PhD, Armelle Pin, Lance Kizer, PhD, and Loren Perelman, PhD. "Deriving Renewable Squalane from Sugarcane." Cosmetics and Toiletries Magazine 129.6 (2014): n. pag. Centerchem. Web. Picardo, Mauro, Monica Ottaviani, Emanuela Camera, and Arianna Mastrofrancesco. "Sebaceous Gland Lipids." Dermato-endocrinology. Landes Bioscience, Mar. 2009. Web. Tsujimoto, Mitsumaru. "A Highly Unsaturated Hydrocarbon in Shark Liver Oil." ACS Publications. The Journal of Industrial and Engineering Chemistry, n.d. Web. Article image: Intersect (source: PublicDomainPictures.net).